This is one of my staple foods when not on a raw food diet. It is a much lighter and healthier version of pasta than wheat-based pasta. It is also dairy- and gluten-free. Instead of pasta, I use rice noodles. But check that they are really made of 100% rice and not mixed with wheat flour. Instead of flour to thicken the sauce, I use arrowroot powder, and instead of cream, I make cashew cream in a blender. The secret ingredient are dates, though not too many, to add a touch of sweetness to the pasta sauce. 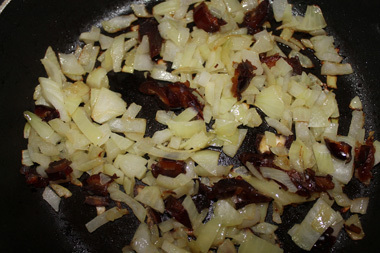 Stir fry onion in olive oil for 1/2 minute, then add a little water and two chopped dates for sweetness. This is a great trick and I use it with many different dishes, whether raw or cooked: the sugar of the dates adds sweetness to the dish, which intensifies the flavor as long as you don't overdo it. Add gluten-free veggie stock, black pepper, and maybe little tomato puree (I didn't have any). Let it simmer in a little water and oil until the onions are soft. Next, for thickening, arrowroot powder is gluten-free and works well. The sauce thickness is different from using flour as a thickening agent but arrowroot has no overpowering taste so it's fine. Be careful, however, as it clumps up just like wheat flour does. 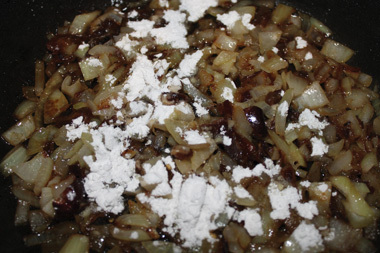 My trick is to mix it in with a lot of dry ingredients and oil, and then gradually add liquid. After cooking down the sauce for a while add mushrooms, some ground mustard seeds and some chopped 'scotch bonnet' red hot chilli. I buy whole mustard seeds and grind them down using the back of a spoon on a chopping board. Next, prepare cashew cream in your blender by mixing water with cashew nuts to a desired consistency. Pour into the sauce, mix in, and add gluten-free soya sauce to improve the colour and to add saltiness. Cook rice noodles separately. I buy mine from a local Chinese supermarket. Check the label to ensure that no wheat is added. Rice noodles normally need only a few minutes of cooking. Do NOT mix in with the sauce. Pile on the plate separately. 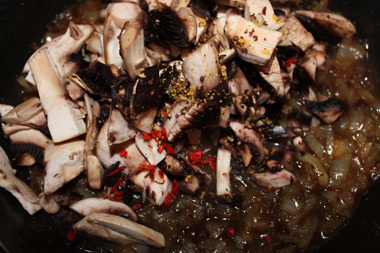 Arrange on the plate: Rice noodles, pour the creamy mushroom sauce over, grate black pepper on it. Chop some spinach or any other greens and sprinkle over. Add chopped cherry tomatoes, cashew nuts, and, if desired, a little olive oil and gluten-free soya sauce on the rim. If necessary, add Himalayan sea salt on top to taste. The key in this dish is to balance the creaminess, the sugar from the dates, the salt, and the hot chilli and black pepper to your liking. It is a good idea to always add some raw ingredients to your food. In an ideal world it would always be at least half raw food, but even to commit to 1/3 of the dish raw would be a very good start. In this dish I mixed in halved cherry tomatoes and a few spinach leaves in the end, but I could have also added some chopped lettuce in, and mixed the noodles with some courgette noodles (grated courgette, i.e. zucchini), half and half.